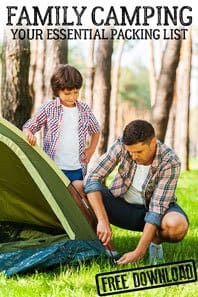 During the toddler and preschool years as well as learning some basics to set them off for school children need to learn some social skills one of those is turn taking. This week’s Virtual Book Club for Kids post works on both a colour knowledge and turn taking. 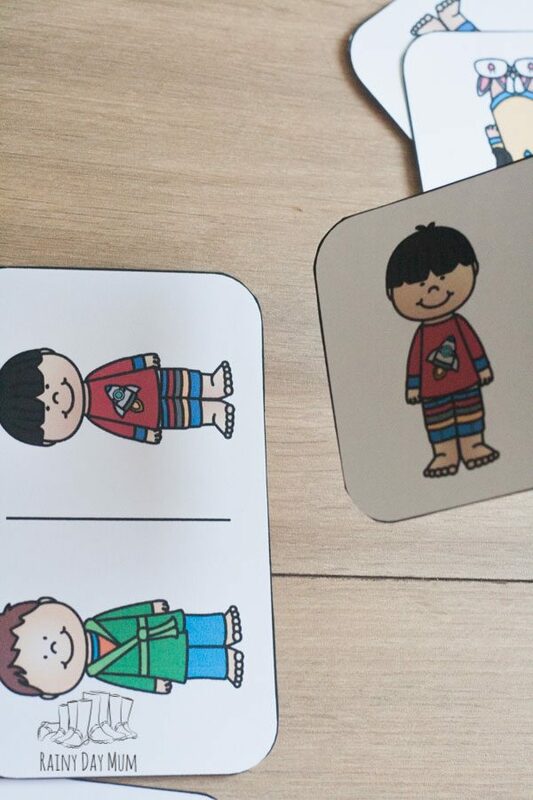 Based on the theme “Bedtime” and the book – Llama Llama Red Pajama by Anna Dewdney we have created a Pajama Domino Game for you to print, download and play together taking turns to match the different colour pajamas that the children are wearing. 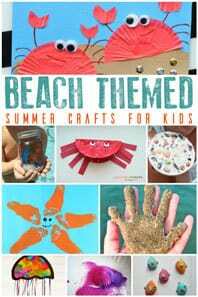 Find out more about the Virtual Book Club for Kids and how you can join in each week. Llama Llama Red Pajama by Anna Dewdney is a classic rhyming book ideal for toddlers and preschoolers. 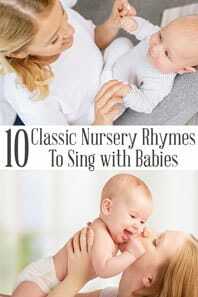 Perfectly capturing the way that bedtime goes in many houses around the world with young children the book rhymes its way through getting to bed and not wanting to go as the little llama doesn’t want to leave his Mama. 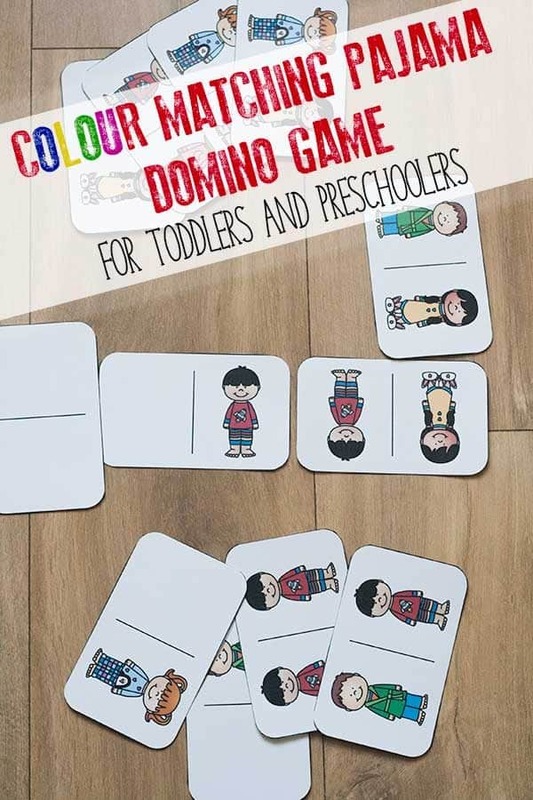 Join our Toddler and Preschool Weekly Activity Planner Emails and get this Colour Matching Domino Game for FREE. Join Now and Get Your Domino FREE! If you do not wish to join our Book Based Activity Planner Emails, the game can be purchased from our Store. 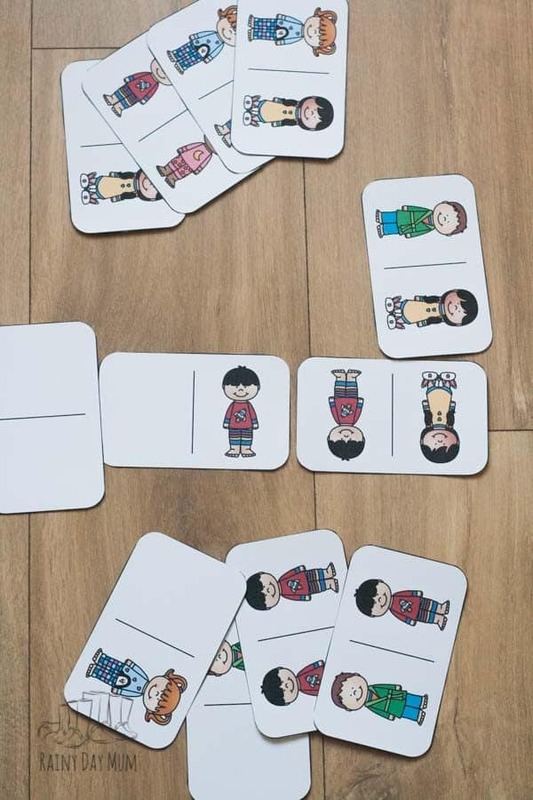 Download the Pajama Domino Cards and Cut Out. 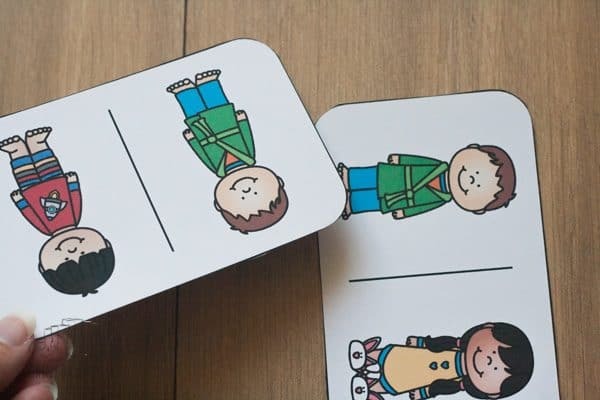 I printed on card stock – to make them sturdier you could use a cardboard box and glue the cards on and cut around – this would make it easier for toddlers and young preschoolers to grab the cards an Amazon box is ideal as they are made of thicker cardboard. 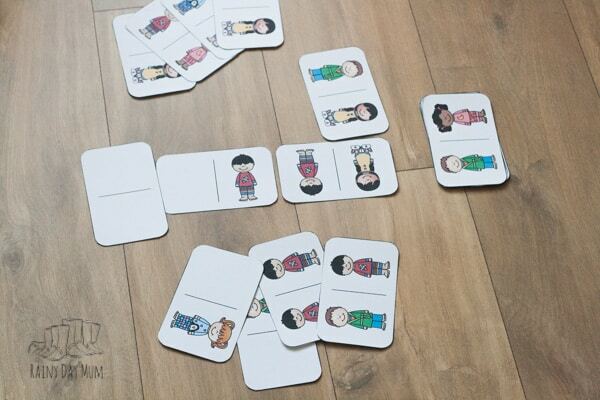 If you are playing in a small group then I recommend printing out multiple sets of the domino game and combining them. 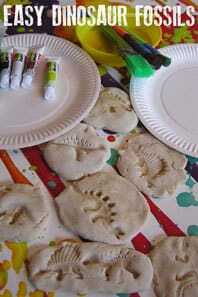 More Llama Llama Red Pajama Fun with our Pajama Pattern Activity. Before starting we reviewed the colours on the cards. Green, Yellow, Pink, Blue and Red. Then shared out 4 dominoes to each player. Taking in turns we laid the domino to match the colour of the pajama – if we couldn’t go then we took a Domino from the pile. The winner is the first to use all of their domino cards. 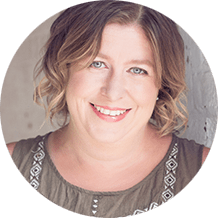 Based on the classic Bedtime and Construction themed book Goodnight Goodnight Construction Site by Sherri Duskey Rinker this game is sure to be a hit with your toddlers and preschoolers. One of our favourite counting rhymes – Five Little Monkeys Jumping on the Bed is ideal to sing together this week for a bedtime theme – and these Five Little Monkey Finger Puppets would be great to use as well. An old one but a classic this Bed Bugs Game was around when I was a child – it’s great for fine motor skills as you have to pick up the bed bugs that are moving all over the bed. 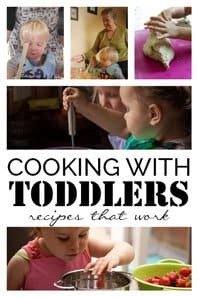 This week the cohosts of the Virtual Book Club for Kids have produced some fantastic Bedtime themed Activities based on the featured book of Llama Llama Red Pajama why not check them out for more toddler and preschool fun to connect and create with books. 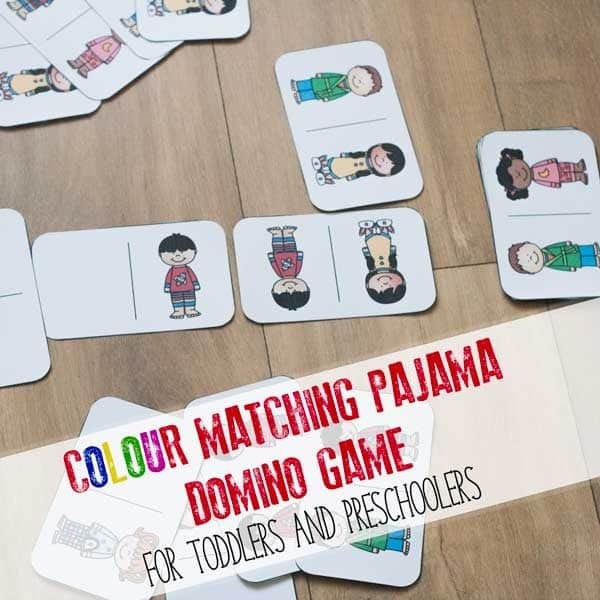 Colour Matching Pajama Domino Game – You Are Here!